I’m Madigan, the blogger behind Madigan Made. I work by day and create and blog by night. I strive to find simple, easy, yet chic ideas for my home. I love to write, take photos and make stuff, which is perfect for a crafty DIY blog. Some of my other loves include: my handsome hubby, my crazy pup, dark chocolate and lots of coffee! I’m thrilled that Allison is letting me crash here today! Today I wanted to share with you a simple decor project I made for my kitchen. I created a picture-within-a-picture-frame that hangs in our kitchen. I bought this chunky frame for $10 at an antique store. Yikes! Not so cute, right? And it was big and heavy! I was not sure what do with it, but I thought this frame would look great with another picture mounted on the inside of it. We have quite a few red accents in our kitchen, so I primed then sprayed the entire big frame with Rustoleum’s Colonial Red. The red seemed a little bright, so I used antiquing glaze to highlight the details of the frame. Then I painted the interior field area with black craft paint. To hang the interior frame on the larger frame, I just used Command picture hanging strips! They work great and make it easy to change the frame when I want to! I hung the double frame above the wooden cart in our kitchen. I love that extra hit of red in the room. The beauty of this set up is that I can change out the interior frame with something else. Over the past year, I created different (free) seasonal printables and changed the frame and cart decorations for each holiday (Halloween, Thanksgiving and Christmas). Once spring came around, the red frame seemed out of place. So, I found another cheap frame and made a white frame-in-a-frame for the space instead. If you were interested, stop by and check out the Easter and summer decor I used with that white frame. The interior frame makes it so easy to decorate for the holidays. 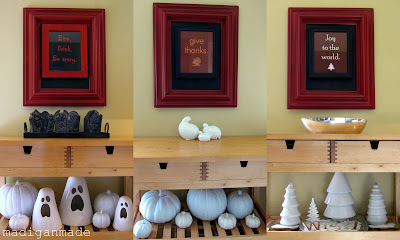 With a simple print and frame change, I get a new look that coordinates with the seasonal decor I use on the cart. And I can always switch back to the apple print when I want a more neutral image. If you like this project, come on over and say hi at Madigan Made! Aside from home decor projects, I love to make easy crafts and simple recipes. You can also find me on Facebook, Pinterest, Twitter or StumbleUpon. I enjoy sharing ‘behind the scenes’ info and other great ideas I find. Thanks, Allison, for the invite! Hope you are having fun while you are away! Madison, Great guest blog!! I love what you created, beautiful!! Your location is a great idea. I love how you used different pictures at different times of the year. How cool that you can change this by season or holiday or mood!! Thanks for the great idea!! Creative idea. Thanks for sharing this.